Dispatches by James Fallows and others, and responses from readers, on the match between digital technology and human thought. As the years wear on, my esteem grows for the writing program Scrivener as the single best bargain ever offered in the software world. And I mean: ever. It was originally for the Mac but now comes in a Windows version; it costs all of $45; and it is a program that seems ideally tailored for the way that many writers, including me, would like to approach their work. You can see its (quite impressive) list of testimonials here; read a detailed description of its power from a U Chicago student, Noah Ennis, here; and consider some previous discussion here and here. I've now written two books, two or three dozen Atlantic articles, and many other reports and presentations with Scrivener. I was pleased that its creator, Keith Blount of Cornwall, England, appeared in this space as a guest blogger two years ago. There is a new entry in the lineup from Literature and Latte, Blount's little software company. It is called Scapple, and I mentioned it earlier, during its beta period, here. It costs all of $15 (technically $14.99), and if you have any interest in software or idea-sketching, and if you are using a Mac, you would be crazy not to try it out. I'm using it right now for a big forthcoming project. I won't try to explain this but will just suggest that you give it a try. It's Search Visualizer, a web-based system that processes search results from Google and other search engines and displays them in visual form. Here's an idea of how the results look, based on a sample search for data about the 787 Dreamliner's battery problems. I've tried a variety of "search front-ends" over the years and so far have always ended up going back to plain old Google. I don't know whether Search Visualizer would meet the long-term usefulness test, but its approach is interesting. The company lays out scenarios in which it thinks such visualization would pay off. Over to you to see whether in your search circumstances it makes sense. Keeping track of All the Things(™) isn't that difficult. Or at least it shouldn't be, but I find it nearly impossible. ... and he goes on to list nearly a dozen programs, most of which I've used -- along with many others! He doesn't even get into such timeless classics as Lotus Agenda, the still-evolving Zoot, TheBrain, MindManager, OmniFocus, Scapple, Thinking Rock, and .... Wisest not to get me started. While I love them all, I've whittled it down to 3 apps: Tinderbox, Evernote, and DEVONthink. Tinderbox is my notebook. Evernote is my junk drawer. DEVONthink is my filing cabinet. He goes on to explain what those analogies mean. For the record, Tinderbox and DEVONthink are Mac-only; Evernote is trans-platform; plucky Zoot is Window-only; and Lotus Agenda runs on DOS! Of course, stay on the lookout for whatever David Allen and Intentional Software are cooking up. For decades now it's been a careful balance, between the time I "save" through new "productive" software, and the time I "waste" trying out each new release. I am somehow relieved to know that I'm not the only one contemplating this balance. 1A) An interesting thing about the "interesting-software" realm for the Mac, where I've done most of my work for 4+ years after fleeing the nightmare known as Windows Vista, is that the comparatively smaller number of high-end programs (relative to the Windows universe) means that people spend more time thinking about how the programs might work together. The usual-suspect lineup here includes the unbelievably wonderful writing program Scrivener; the powerful data-storing and -searching program DevonThink Pro; Tinderbox; the Omni, CircusPonies, and Aqua Minds families; cross-platform programs like The Brain and Mind Manager; and some others. I note this as an intro to mentioning a useful step one-two-three demo on how to make Tinderbox and Scrivener essentially work as one unified program. It is by a British Tinderbox tech whiz named Mark Anderson. He has also explained, in a link I'll provide another time, how to get info out of MindManager and into Tinderbox. 2) Scrivener is out in a new version, release 2.3. The program is only $45, and it offers a 30-day free trial. Since switching to it four years ago I've consistently viewed it as the very best program for writing, ever. Scrivener is not concerned with "tactical" issues -- formatting, fonts, spell check, and all of that. Indeed, once you've finished the "real" writing in Scrivener you export the results to Word, Google Docs, or some other program for the last-minute tidying up. Instead Scrivener excels in helping you organize and plan what you're writing. You won't hurt my feelings if you try it and don't like it. But for me it has been wonderful -- and you'll see that I'm not the only one. (My two latest books, and several dozen most recent articles, were all produced via Scrivener.) A Windows version is now available, but I haven't tried it myself. Keith Blount, creator of Scrivener, also did a stint here as a guest blogger. For the record: I tried to get Tom Davis, the creator of Zoot, signed up for guest-blogger duty in the same stretch as Bernstein and Blount, but he was too busy cranking out a new release of his program. 3) I have heard from a number of people about the virtues of an email anti-spam program called SpamSieve. (For instance, Michael Ham has written about it here.) I haven't used it, since it doesn't work with (a) the web version of Gmail, which has its own very powerful anti-spam routines, (b) the latest release of Thunderbird, which I use to create offline email archives and whenever I get too annoyed by new-look Gmail. But if it fits your needs, for instance with Apple's email programs, SpamSieve could be worth checking out. 4) Speaking of Thunderbird, the chair of the Mozilla Foundation, Mitchell Baker, has announced that Mozilla will no longer develop new features for Thunderbird. Or, as she put it, "continued innovation in Thunderbird is not a priority for Mozilla's product efforts." Sigh. Sic transit gloria Thunderbirdi. But the latest release, version 13+ on the Mac, seems a lot sprightlier than earlier versions. And after the jump, a nerdish tip* some readers have sent for keeping it from hogging all CPU cycles on a laptop. * Thunderbird speedup tip: If you're using it mainly to have your own desktop backup of material that otherwise is stored vulnerably in the cloud, then you can stop reading here. But if you're using it on a laptop so that you can deal with email when on a plane trip or otherwise offline, here is a way to reduce significantly the strain it puts on the CPU. The crucial point is to keep your laptop Thunderbird client from downloading and syncing all the mail in your entire Gmail archive, reaching back for years. You do want the all-mail sync on your desktop, so you'll have an "in case of disaster" backup archive of your own. But if you follow the steps in this item from the MozillaZine "knowledge base," you will have the detailed instructions for limiting the laptop files only to the small sample of current messages you want to deal with rather than anything you've ever sent or received. - and others you'll see on his site. If you are interested in software, you will be interested in this. 1) Chinese hoops. Here is a very nice brief video, courtesy of reader AK and SB Nation, of Stephon Marbury joyously celebrating with his Beijing Ducks teammates after their victory over the Guangdong Southern Tigers to win the Chinese Basketball Association championship. Really, this is heartwarming in about twelve different ways -- and a partial balm for this season's untimely end to Linsanity. 2) Aussie beer. The promised full retrospective report is still to come. But as a guide to anyone who wonders whether Australia's brewers, long famed for blah watery lagers, could produce something more ambitious, here are another two signs of progress. One is the Stow Away IPA entry in the James Squire line of craft brews, shown below in its natural setting in a James Squire brewpub in Hobart. (The company itself is based in Sydney -- and is owned by Kirin, which in turn is part of the Mitsubishi combine.) Stow Away is the purple one on the left and is about the closest thing I've found in the Antipodes to the current American-style IPAs. Here is how it looks in action at the brewpub, at right, showing its convincing rich hue. It's the one being held; the other is the Four Wives Pilsener. Be warned that until the Aussie palate becomes fully evolved and moves the market with it, this still seems relatively hard to find. Many "bottle shops" that stock the rest of the James Squire line seem not to know about Stow Away. The other candidate: from the Malt Shovel Mad Brewers (a James Squire subsidiary), a short-term summer seasonal offering called "Hoppy Hefe." I wouldn't have picked this out as a Hefeweizen, since it doesn't look cloudy or taste particularly of wheat. But it certainly is full of hops, which makes it unusual locally and for which I am grateful. It's also full of alcohol: 7% (like Supplication and some others from the famed Russian River line), so a little goes a long way. This southern-hemisphere summer season is ending rather than beginning, and so is this beer's run, so if you see a bottle, don't miss the chance. Side note: beer is expensive in Australia, largely because of taxes, and this is extra-premium priced, at roughly $10 for a 640ml bottle, about the size of two "normal" bottles. Close-up shot of the bottle, so you can recognize it, below. 3) Interesting software. Over the years -- really, decades -- I have ended up playing working with the same set of "interesting" programs for storing info, classifying it and moving it around, and generally observing the relationship between software and thought. The perennial favorites include Zoot, Windows-only, which I've used for nearly 20 years and is recently available in a whole new version; Tinderbox, Mac only, a more recent favorite; Mind Manager, Windows and Mac, which I find useful for outlining (as I do OmniOutliner, for Mac and iPad); and among others (including the indispensable Mac duo of Scrivener and DevonThink) there is also Personal Brain, for Windows, Mac, and Linux. I won't take the time to lay out the whole theory of this idiosyncratic but seductive program. I will say that a new version, The Brain 7, is out in beta, and I've been using and liking it. If this is the sort of thing you are interested in, you will be interested in this. Thus endeth the uplift for now. 1. It makes all writing projects, but especially any large project, easier and more pleasant. My old method was to have a bunch of different Word documents open, and to move between them with a lot of time spent searching for windows and a lot of redundant writing. For [his undergraduate thesis], I ended up with something like 40 documents of which I only ever used 8 or 10. In Scrivener everything is instantly accessible and easy to switch to, which paradoxically means that I can write more haphazardly-- I can paste large block quotes from sources instead of putting a link, I can keep multiple outlines going at the same time as I'm writing. To say nothing of the full screen mode. I'm completely baffled that appleworks, word, and textedit haven't done something as simple as allow document loading from a side bar, or implement a fullscreen button (or if they have, I'm baffled at my and my friend's ignorance of these features). I'm convinced that if I had Scrivener when I was writing the [thesis], I could have saved literally dozens of hours of redundant work simply from better organization. 2. Scrivener means that I can keep all of my lists and files in one or two central places, instead of in 50 word documents in my OS X dock. I used to have to hunt for the appropriate document every time I wanted to store a word, quote, book title, new concept, article, person's name, block of text to read later, etc.. Now I can do it in one place (and again, paradoxically, this means I can multiply the number of bins I have because the attention externality of each bin is so much lower. So I can make a bin for quotes about "ways of reading" where before that level of specificity would take too much time to access quickly and frequently). 3. Scrivener gives me a central place to keep all of my French word lists, tasks, practice, and articles, where before I had some horrible mixture of documents, website bookmarks, notecards, etc., etc. Since language study is hard and I go out of my way to avoid it, making it even slightly more convenient is a big help. 4. Scrivener allows me to create daily reading assignments that are centralized (one document) and offline (not distracting), and to simultaneously archive what I've been reading (and to keep notes on it in the same place). So when I see something to read, rather than adding its url to a list and hoping to go back to it, I can paste the text into a scrivener document for that day or week, meaning a) I have an effortless record of what I'm reading, b) I have a place to go to procrastinate, rather than idling about blogs and websites, and c) I can do the reading with the wireless turned off, so I don't check email every 15 seconds as is my way. Overall, a magnificent product and im shocked that the mainstream word processors dont copy the more obvious features (full screen, documents on side, not having page breaks). Again, this is interesting incidentally because it's about one program but more generally for what it says about the ways computers work with, and against, our brains. "I'd like to let you know that InfoQube (IQ), while still a bit unknown and not out of beta yet (but soon to reach v1.0 ), is a very powerful Outliner too! "In my humble opinion, probably the most powerful and flexible out there. Really. I have been using it for the last 2 years, doing incredible things with it... Not only does it do outlining, but it also has a calendar, Gantt charts, pivot tables, etc. "It's not your typical software : it takes an open mind and a bit of reading (not that much!) to understand its principles. These small initial efforts are quite rewarding, that's for sure! Have a look at it (Download), and feel free to ask questions on our friendly Forum. ["Our" = user community, not speaking for the company itself] Pierre Paul Landry, our IQ talented, dedicated and friendly developer, answers many questions himself." Here's a thematic illustration from the company's site, on the "Qube" theme. (Click for bigger.) Disappointingly, the actual program is confined to normal 2-D computer screen displays. I have not yet tried InfoQube myself, but I received enough mail from people who have that it seemed worth mentioning. While I'm on the subject of satisfied users, I have mentioned several times the modestly-priced, Mac-based writing program Scrivener, on which I am relying for more and more of my work. An impressive list of writers (mainly novelists) who have become devotees is here. Worth considering. While out of range for the past week, I've not weighed in on a lot of subjects I would normally have a view on, from the Nigerian would-be suicide bomber, to the nature and function of the TSA, to the implications of press and judicial developments within China, to the latest twist in China's policy on the RMB. I will plan to catch up, on each and all, in the next day or two. For the moment ... how about a promising entry from the world of "interesting" technology? 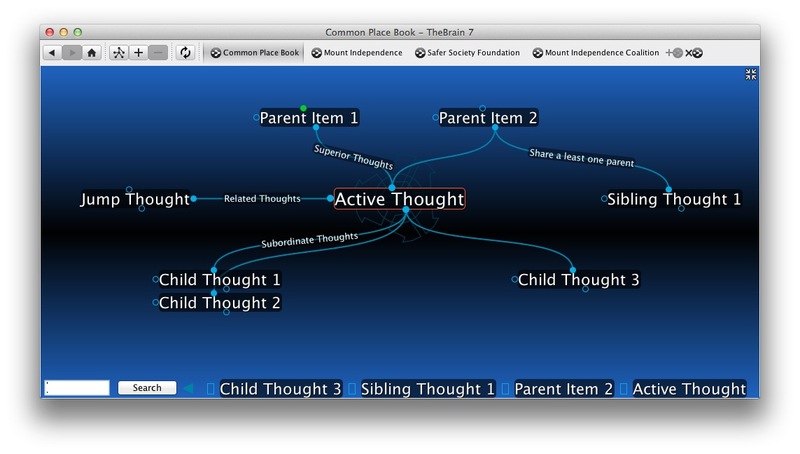 What I have in mind is Thinklinkr, a free, "cloud"-based outlining program that very much deserves attention. Since the dawn of the personal computing age, outlining programs have constituted a fascinating but often heartbreaking product category. Fascinating because they are an essential component of electronic "thinking tools." (Another essential component: systems for collecting, organizing, and retrieving info. And ideally one more: something to do the actual thinking and writing. So far, no dice.) Heartbreaking because several of the best entries have atrophied or been orphaned, and others are minority tastes. Perhaps it's mainly rosy retrospect, but I still think the classic DOS outliner GrandView was the best I've ever used. Background on GrandView here. Those I use and like these days include the elegantly minimalist BrainStorm (PC only); the intriguing-in-many-ways PersonalBrain (PC, Mac, LInux); the also-intriguing MindManager (PC, Mac); OmniOutliner (Mac); plus the outlining functions in the wonderful Mac-only writing program Scrivener; plus the outlining functions in the upcoming Version 6 release of the wonderful PC-only "idea processor," Zoot. (Zoot 6 is in late beta.) And some others I am forgetting right now. Reference section: For a history of the outlining field in general, start here; for a later "rediscovery" of outlines, go here. For my previous perspectives on and judgments about other "thinking" systems, see this about Zoot; this about BrainStorm; and this about Personal Brain. For a blog by the designers of Thinklinkr, see a sample entry here and main page here. I have written to the company to ask about the ideas behind the program and will post the answers shortly. Thanks to Michael Ham for the lead. I am a long-standing devotee of the David Allen "Getting Things Done" (GTD) approach to life, as I first described in this Atlantic article about him four years ago. We've become friends and stayed in touch since then too, which at least for me has been very enjoyable. Plus, since long before the Atlantic wrote about him he has been a loyal subscriber! The GTD Way mainly involves habits of mind and action, but it also places a lot of emphasis on having the right tools, gizmos, and gimmicks to support those habits. Over the years I've used a variety of software to set up GTD-based systems on my computer. Ones I've liked include Results Manager and Chandler. The one I keep coming back to for my own purposes, more than a dozen years after I started using it, is the idiosyncratic but powerful Zoot. Zoot is PC-only, and for that matter text-only (no graphics etc), but it runs flawlessly on a Mac under VMWare Fusion. 1. OmniFocus (Mac only), from the same group that makes the excellent Mac outliner OmniOutliner. This is the most straightforward of the programs I'm mentioning here. You set up Projects, Contexts, Actions, etc, straight out of the GTD gospel, and you go from there. 2. ThinkingRock (PC, Mac, Linux), from a tiny firm in Sydney, Australia. Maybe I should move to Australia: apart from the obvious attractions, a disproportionate amount of "interesting" software seems to come from there. I've previously praised Surfulater, for collecting and sorting material from the internet, and Rationale (and its offshoot bCisive), designed to assess the strength and logic of arguments. ThinkingRock is from this same innovative tradition. 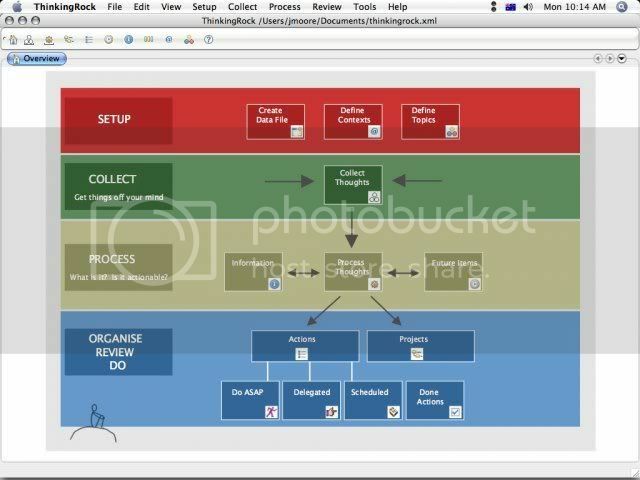 It looks "different" (see below; click for slightly bigger version), it has a different kind of logic from the standard old PC-based program, but it also adheres very closely to the GTD vision and spirit. Like Zoot, it takes some adjustment and learning. (I still prefer Zoot to all others because it is almost infinitely configurable and adjustable.) But certainly worth checking out. 3. MonkeyGTDWiki, which also is absolutely intriguing in the way it looks and works, and also clearly springs from the GTD tradition. The simplest way to explain it is as a browser-based personal Wiki, which you can configure to show your projects, actions, contexts, deadlines, and so on. Demo here and underlying info about the TiddlyWiki engine here. Because it's browser-based, it obviously works with any kind of computer. It requires more digging-in even than Zoot, but it has its rewards. Have fun. Also, this post from LifeHacker discusses some other GTD systems. Update: Discussion of a zillion, or more precisely 102, GTD-related programs can be found here.